At a press conference last Tuesday, Mayor Bill de Blasio announced his plan to fight homelessness, aiming to decrease by 45% the number of hotels and cluster apartments being used to temporarily house the homeless over the next five years. (The latter are apartments rented by the city to house the homeless). As part of a more community-based approach, the city aims to create new neighborhood-specific shelters to help manage the transition. According to a representative from the Mayor’s Office, these new, larger shelters will keep the city’s overall homeless shelter capacity constant. New York City’s homeless population is at an all-time high, with about 60,000 people living in shelters, cluster apartments, and hotels around the city. The Mayor stated that rent has increased in the city by 19 percent since the economic recession while the average household income has decreased by 6.3 percent, leaving many families in a bind. These displaced families make up for 70 percent of people living in shelters, according to de Blasio. Because of the city’s legal obligation to house anyone who asks for shelter, it has been forced to move people into cluster apartments and even hotels, racking up a bill of $400,000 a day, according to The New York Times. These statistics are a large part of why the de Blasio administration has struggled to combat homelessness and income inequality; related tactics have included rent stabilization initiatives and rental assistance to those who are at risk of becoming homeless. The city currently has 647 buildings operating to accommodate the homeless, and de Blasio proposes to vacate a majority of those sites, predominantly cluster housing and hotels, within the next five years. The end goal is to have 364 total sites operating in the city. In order to do this, the system will become more dependent on shelters, adding 90 new shelters and expanding on 30 existing sites to accommodate for the shift. A representative from the Mayor’s press office said that 18 to 20 new shelters will be completed each year, several of which would be purpose-built new construction, over the same five-year span. The remainder will be existing buildings, and in some cases, empty cluster housing sites that will be repurposed and renovated to become new shelters. On top of the goal to decrease the number of shelter sites, the city also hopes to decrease the number of homeless in shelters by 2,500 in the next five years. The representative emphasized that despite the decrease in sites, the city is not decreasing its capacity to house the homeless, just reallocating it. The city also plans to refurbish existing shelters in poor condition. “We’re going to do a comprehensive effort around the city to bring all shelters to a better standard of quality,” said de Blasio. These renovations will create more appropriate spaces for the shelter’s occupants to stay during the day to participate in training and education programs. The city hopes this will keep residents off of the streets, a benefit for the community, and help get them back on their feet faster. Another major crux of de Blasio’s new strategy is to keep the homeless in their communities, where they are closer to their jobs, schools, and houses of worship. This community-based shelter system would place new shelters in neighborhoods with a high number of homeless currently in the system. The first of those facilities will open this April in the Crown Heights neighborhood of Brooklyn, which is home to 132 families currently in shelters and scattered throughout the city. de Blasio plans to continue pushing for more affordable housing, with 200,000 new and preserved affordable apartments on the way, providing options for seniors, veterans, and low-income families. The city would also increase supportive housing initiatives, which provide on-site support for substance abuse and mental illness, to help the homeless regain independence. Meanwhile, on the other side of the country in Honolulu, Hawaii State Senator Josh Green introduced a bill that would allow doctors to prescribe housing to homeless patients that suffer from mental illness and addiction. In a study quoted by The Guardian, research has shown that healthcare spending for homeless patients, particularly those struggling with mental illness and addiction, decreases by 43 percent when they become housed and are provided with supportive services. These new initiatives suggest a change in the way governments are viewing and treating homelessness and, hopefully, will open the conversation to new and innovative solutions. 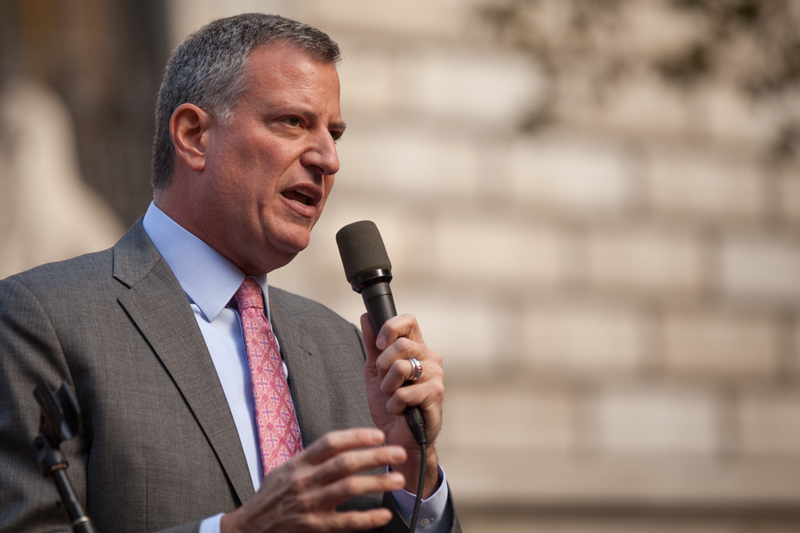 To read more about Mayor de Blasio’s plan, click here.